I have been looking for ways to enhance my academic abilities and to express my creativity. So, I recently ventured into the market looking for a good beginner saxophone. I needed an instrument that had high-quality construction, produces good sound, and one within my budget. Luckily, I found the Windsor MI – 1005 Student Alto Saxophone Outfit. When you are in the market looking for a good beginner saxophone, you ought to consider a couple of things. For instance, you wouldn’t want to take home an alto saxophone that disappoints in performance. It is imperative for you to find an instrument that is of high quality and that produces good sound. This alto saxophone is specifically designed for novice players. The Windsor MI – 1005 Student Alto Saxophone Outfit features a gold Lacquer finish, responsive spring keys, Pearloid keycaps, and an engraved bell. This instrument also includes accessories such as a cleaning kit, an adjustable strap, a cork grease, and a lightweight plush line case. Moreover, it is suitable up to grade five. I highly recommend this instrument to beginner students because it is well crafted to enable excellent playability and to produce a rich tone. Moreover, it is available at an affordable price and is suitable for novice players who would like to advance their skills. The price that you pay for a good beginner saxophone matters a lot. This is because you will probably use it for a while before moving on to another sax as your skill level improves. Therefore, it is advisable to go for an economically priced saxophone. If you are looking for an affordable sax, go for the Windsor MI – 1005 Student Alto Saxophone Outfit since it is available at $299.99. 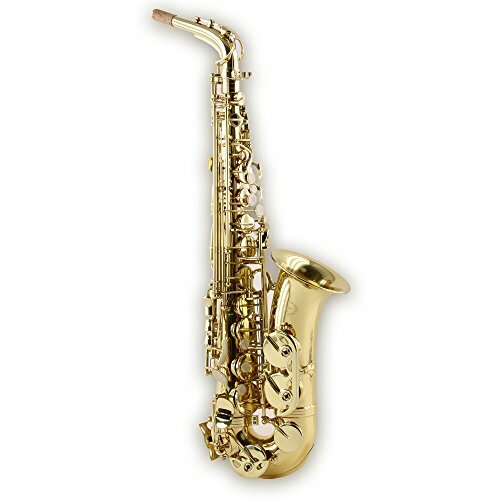 As a novice saxophonist, you need a high-quality instrument that is excellently designed. Nothing is as discouraging as a poorly constructed saxophone that produces low-quality sound. As a beginner student, you need a dependable instrument that makes learning how to play easy and fun. The Windsor MI – 1005 Student Alto Saxophone Outfit is a reliable instrument because it is specially designed to deliver comfortable playability and produce a superb tone that makes playing enjoyable. The Windsor MI – 1005 Student Alto Saxophone Outfit includes accessories such as a cleaning kit, an adjustable strap, a cork grease, a mouthpiece ligature reed, and a lightweight plush line case. When you are starting your lessons, you need to have the necessary items with you to gain the skills required to master the art of the saxophone. The Windsor MI also comes with a hard case to ensure that your instrument is protected. Moreover, the storage case will help you to ferry your instrument safely and easily from one place to another. The Windsor MI – 1005 is a saxophone that features an ergonomic design. Its design makes it easy to hold and enables smooth playability. It is also lightweight so that you can play for longer hours. I recommend the Legacy AS750 Student/Intermediate Alto Saxophone because it is quite affordable, and it features a superior quality lacquer finish. This product also offers a great intonation, and it has a superior tone. The AS750 also comes accessorized with a hard shell canvas case, which protects the instrument and serves as a backpack. This is yet another alternative to the Windsor MI - 1005 that I would recommend to novice players. Etude EAS-100 is built out of high quality metals to enable the production of a superior tone. It is an excellent product for a novice saxophonist because its pads, key works, and adjustments work in unison to allow an easy tone production. Moreover, the bell brace features quality constructions to ensure the longevity of the instrument. The YAMAHA YAS-280 is designed with the novice player in mind. However, it is relatively expensive as compared to the Windsor despite it being a high quality saxophone. This saxophone is ergonomically shaped to allow comfortable playability. Its stable neck receiver offers easy playability, promotes a quick response, and enhances the instrument’s durability. Finding a good beginner saxophone requires an adequate market research so that you can settle for an inexpensive and quality instrument such as the Windsor MI – 1005 Student Alto Saxophone Outfit. A good novice sax should promote easy playability, has enhanced tonality, and is built to last long.